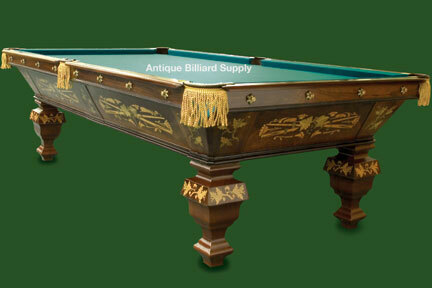 #3-08 Very old Brunswick antique pool table with extensive ornamentation. Rosewood cabinet sides with hand inlay patterns of contrasting woods. Unique design shows two pool cues crossed amid decorative items. Diamond sights on the top of each rail. Nine-foot size with four-piece Vermont slate playing surface. Unique table of investment quality. Completely restored, ready for immediate delivery.